One of my favorite fabric designers is Tone Finnanger of the Norwegian company Tilda. A few months ago I ordered a number of fabrics from England, which seems to be the closest place to find Tilda fabrics. Known for their whimsical and romantic prints, Tilda fabrics are perfect for 1/6 scale sewing. This particular pattern is called “Christmas Play in Mini Rose.” We have been having a great deal of wind and rainy weather, so I made a trench coat set in this grey printed cotton. Tiny, old fashioned roses are scattered on a grey ground. 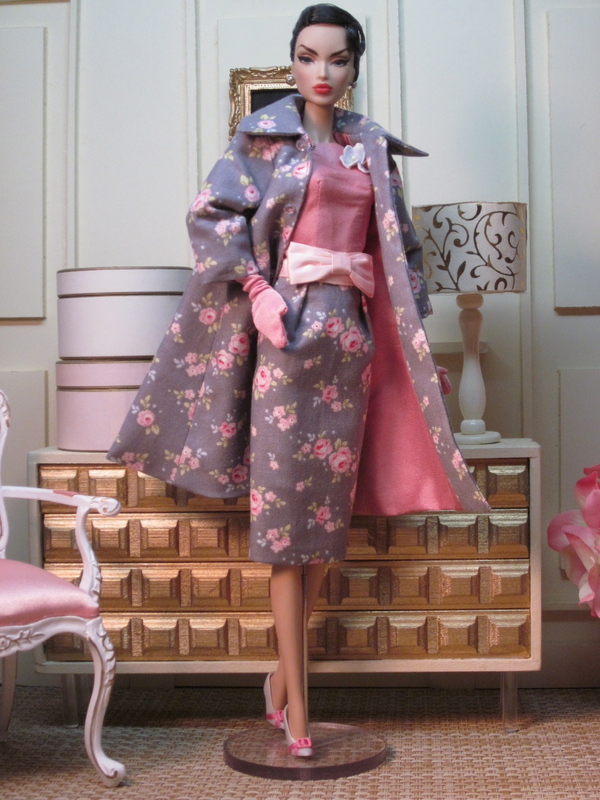 The coat is lined in an antique rose silk and sports pale pink faceted buttons. The sheath dress has a rose printed skirt and antique rose silk top. A pale pink silk sash and bow accent the waist. A cluster of vintage velvet millinery flowers with Swarovski crystals in the centers as a brooch is a feminine touch. The fabulous shoes are not included, but can be purchased from Ann Grahek’s shop on Etsy. The amazing painting of Barbie as Vermeer’s Girl with a Pearl Earring was a gift from my dear friend Rogier Corbeau.